Water distribution organizations are tasked with more than just the reliable delivery of clean, safe water. They also need to manage and care for the infrastructure itself. Whether you’re rehabilitating, replacing, or simply fixing your assets, extending their lifespan in the safest, most cost-effective way possible is a valuable goal. Age-based replacement, although it can be tangibly analyzed, isn’t always the most effective method for prioritizing asset replacement. While age can often be an indicator of condition and relative remaining lifespan, it can also create false positives. An 80-year-old pipe, free of any maintenance history, may be very sound now and for years to come. Meanwhile, a five-year-old pipe in the same system might require constant maintenance. Which pipe would you choose to rehab or replace first? Other variables need to be considered together, such as material and soil type. For example, a 2018 study found that cast iron pipes located in highly corrosive soils fail at a rate 20 percent higher than cast iron pipes in low corrosion soils. These anomalies can make prioritization seem like an art or an educated guess rather than something that can be tangibly measured. When you’re looking at an entire system worth of data, it can be a daunting task to effectively prioritize capital improvement projects. However, there is a way to take control of all these variables and apply a standardized methodology to your decision-making. Over the course of the last few decades, the utility industry has increasingly invested in GIS as the asset repository. A robust geodatabase allows organizations to create an authoritative record of the locations and attributes of all its assets. This geospatial infrastructure lays the groundwork for location intelligence, and it can also tie into other business tools like modeling, billing, meter, SCADA, and CMMS software solutions. A CMMS can help you track any issues, complaints, and work being done throughout your utility network. A GIS-centric CMMS can do this without redundant asset data or syncing tools by using your geodatabase as your authoritative asset repository. When it comes to tracking information on water quality issues, for example, any associated work orders, labor, costs, and materials can be associated with the asset in the GIS. A good CMMS should also help you schedule preventative maintenance and conduct condition assessments. The more data you collect, the more insights you’ll gain into your operations and the health of your infrastructure. It’s also important to capture existing institutional knowledge. None of today’s computerized systems go back to the early- or mid-1900s. As time has passed, so too have historical events and their history. Formalizing this undocumented knowledge can help with some of your more tangible analysis, as well. Using an application like Cityworks Operational Insights, all of these inputs can be aggregated into manageable values and used to help inform your decisions. 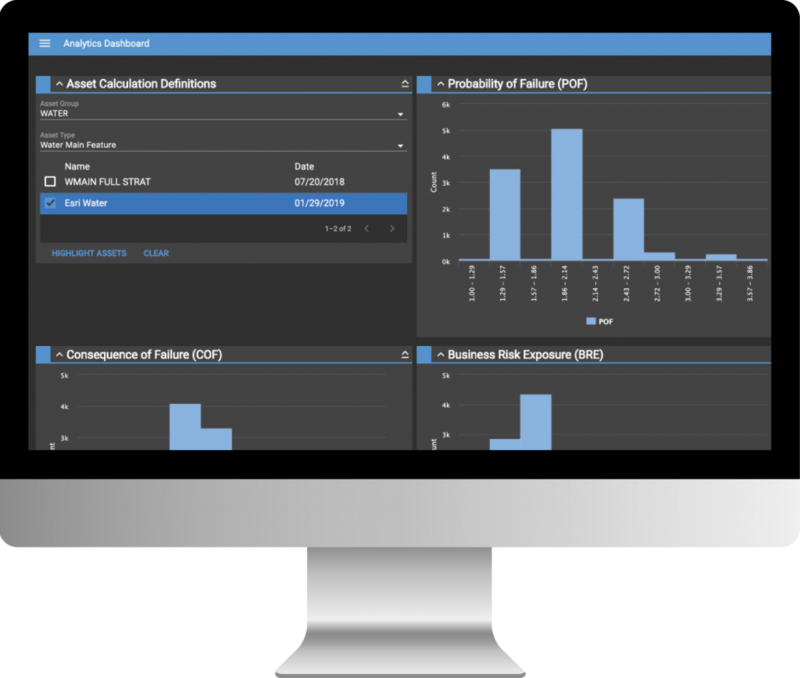 Operational Insights can be configured to use your GIS and CMMS data to calculate the Probability of Failure (PoF), Consequence of Failure (CoF) and Business Risk Exposure (BRE) values. An analytics dashboard displays the results of business risk exposure calculations for water assets. The PoF represents how likely it is that an asset will fail. As I mentioned before, this value isn’t totally dependent on age. Variables like age, condition, material, diameter, and break history can all contribute to this calculation. CoF associates a value with the results of any given asset failure. These results would include not just the financial expense of direct repair and collateral damage, but also any social, environmental, or legal costs. A break in a large water main that serves tens of thousands of people downstream would have a much different CoF value than a small main that serves a few homes in a cul-de-sac. BRE is the product of these two values (CoF * PoF = BRE), and it represents the overall risk of the asset. BRE identifies those assets that are not only more likely to fail but also carry a higher consequence of failure. The weight of these data points could be adjusted based on locale or the history of the network, allowing you to use data to account for and further explore institutional knowledge. For example, if a veteran employee who’s been with the organization for 40 years knows that the mains in the southeast end of town tend to act up more than others, you can dig into what may be causing that and weigh those inputs appropriately. You can take into account the maintenance history on the asset. This will tell you if you are over-maintaining or under-maintaining your assets from both a preventative and reactive perspective. If the data shows that you’re constantly doing point repairs on high BRE assets, it might be time to prioritize those assets for rehab or replacement in the capital budget. Most importantly, since all of these assets are housed in the GIS, they can be spatially viewed and analyzed to discover patterns. They can also be viewed as a heat map to easily see hot and cold spots in your network. Additional spot inspections to ground-truth some of the analytical results can be performed to assure accuracy. With the help of these four tools, you can begin to develop a risk-based prioritization approach to managing your assets—enabling your organization to work smarter to create a safer and more reliable water network for your community. By Josh Stroessner, Cityworks business development manager.